I am writing this article from my standing desk. My prediction for you is that in the next few years, you will see a trending of articles disparaging the standing desk, but not for the reasons you think. You will hear that it is bad for you, bad for your knees, feet, back, and every other section of your body. It will just take a few years to collect enough data to try and prove this theory. Seven or so years ago when I began training people in the classical mode of running (which is to use your feet and calves like springs and run off of the midfoot/forefoot), I predicted that the media would eventually dismiss barefoot shoes as a dangerous fad. I looked like a genius when this eventually happened, but really, it's not fortune telling; it's just simple deduction of human psychology. It's simple to make decisions binary, meaning just "yes" or "no." What happened with the barefoot running shoes was, people assumed that once they put it on, they would naturally change their running style. Why would this happen? Because running the traditional heel-toe way would hurt in these shoes, so you would self-adjust/self-correct for self-preservation. That's not what happened. Many people ran the same and got hurt. People who never ran began to run and got hurt. Many of the incidents weren't because of the shoes; the truth is many sedentary people get hurt once they begin to move — whether it's running or going to the gym. The source issue is deconditioning. Many calves and Achilles are too short on people, from a lifetime of wearing shoes with lifts. Their heels are seldom even with their toes; the last time this was normal might have been when they were toddlers. So once they put on shoes that brings them back to neutral, instead of their Achilles breathing a sigh of relief, it was on stretch. Then they ran and collided with the pavement on their heels, and so injuries happened. People who already had leg injuries jumped on the bandwagon, and their injuries got worsened. Like so often, people reverse engineer and reduce the good habits of already healthy people. Meaning if you're a good runner and have healthy ankles, it makes more sense to wear minimalist shoes. Wearing minimal shoes will not automatically make you a good runner or make your legs healthier. What I did with my clients: broke up the scar tissue of their feet, had them work barefoot, worked on toe extension and foot balance, changed their walking form and posture, then their running form (including arm movements). Then I had them put on minimalist shoes and work their way up to longer distances with proper form. Avoiding pavements at first. What happened? Foot pain went away, people who had no arches developed arches, people who had back pain lost their back pain, and people who never thought they would run again were running again. Was this magic? No. Do I have a special method? No, unless you consider logic and patience, a special method. That has been my greatest asset in helping to heal clients. So my warning to them was not to get distracted when they hear minimalist/barefoot shoes are "bad," those articles and studies don't apply to them. Those articles are talking about the people who thought the shoes were going to be a magic bullet for health. They never worked into those shoes, never worked on their underlying issues, and honestly for many people, those shoes will never be a good idea. This same psychological phenomenon applies for the standing desk. Our bodies have 360 joints, give or take, you stay stationary in any position, and some of these joints will be compressed, some of these joints will stretch out of position. We distribute this wear and tear by moving, constantly moving the load around and diffusing damage. So whether you sit or stand, doing one thing too long will be damaging. An adjustable standing desk (I own the adjustable Standup Desk) is both a regular desk and a desk that can allow you to stand. It gives you both options. That's a start but not enough, you still need to walk away from the desk. Optimal is every 20 minutes. What's practical for you? I don't know. I don't know you. If you only got up every 4 hours to pee, then even getting up every hour is an improvement. If people get a standing desk thinking it will be a magic bullet, "Now I can stand 8-12 hours, and I will be in good shape," they will be wrong. You will have a variation of the same problem, being sedentary. You just changed it from sitting to standing, but you can develop the same problems as security guards or factory workers who stand in the same position for long hours. Healthy people stand a lot, but that's because healthy people don't like to sit for too long. Standing alone will not make you healthy. 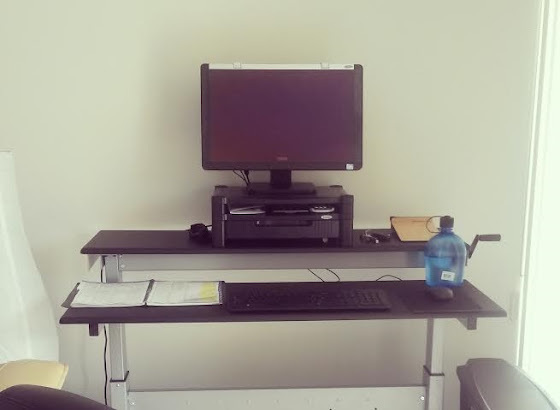 With my clients, I improve posture, make movement a lifestyle, and then we begin to talk about a standing desk because it just makes sense. The core is important, but I never use that term with clients. It is they who bring it up and I often have to shut it down. Why? Isn't that the only thing physical trainers talk about? Yes and that's why it's such a problem. It makes it seem like you can compensate for a sedentary life with just core strengthening. Nothing, no diet, no exercise, can compensate for being willfully confined to a fixed position. Saying "core" is like saying the f-word to a child, their eyes light up and that's all they fixate on. It's important, but people over-emphasize it, leading to compensation. People still don't change their behavior. Move better, improve posture, rehabilitate issues, strengthen the core, but to keep all of this hard work and maintain it, you MUST move a lot — especially at work. Since the "core" craze, there are findings that people are even hurting their backs from too many core exercises. Everything looks great until we tabulate enough data from the people who overdo it. Because that's how we make decisions, like an on/off switch, it's either all in or all out. Because it's less confusing and simple. We say "be moderate" but that's also like an on/off switch, either you're moderate or you're not. And when they look at people who claim "moderation," they still find they are overdoing it, or hardly doing it at all. Because the perception of moderation is subjective and biased. We can't fragment the body and we can't fragment activities, it has to be a whole change. It's the only way it makes sense, and it's the only way it will work long-term. Look for that one thing to improve your health, and you will be who they draw those negative health results on. And they will exist, people will get unhealthy in their pursuit of health (ironic I know), but why does it have to be you? PS: Even drinking 8 glasses of water has been dismissed, with studies of people who got sick or even died from consuming too much water. Yes, everything should be done within reason, but don't throw out the baby with the bath water. In general water is a good idea, you may need it to live, but don't quote me on it (or email me about some article blasting the benefits of water), I am sure someone will dispute that as well.